Burhill Golf Club is owned by the Guinness family through the Burhill Group Limited and it’s the flagship facility of a burgeoning portfolio that now extends to ten golf complexes. 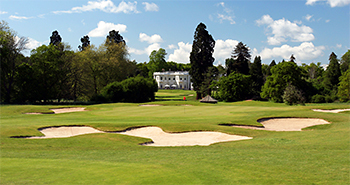 The modern 18-hole New course at Burhill comprises one of twenty-two courses operated by BGL Golf within its collection of golf clubs and golf centres. Former Hawtree design team member Simon Gidman – who came to prominence in very recent times with his critically acclaimed work at the Centurion Club in Hertfordshire – was engaged by Burhill at the end of the 1990s to set out a modern new course as a contrasting, but complementary, 18-hole layout to the classic Willie Park-designed Old course. The New course, along with the newly renovated clubhouse, opened with rather a fanfare in 2001 and by the end of the decade it had established itself as a preferred annual venue for the PGA Europro Tour, one of four development platforms for professional male golfers that exist one level below the Challenge Tour. Highlight holes on the New course include short par fours at the 333-yard 3rd, where the fairway doglegs right to the green, and the 343-yard 16th, with water delineating out of bounds down the right hand side. Undoubtedly, the best is kept until the very last at the 192-yard 18th, which calls for a heroic carry across the River Mole to the home green. The New Course was built at the turn of the century to supplement the existing Willie Park-designed Old Course. Before the war, the Burhill Estate had two courses but the South Course was given over to the war effort and farming and it was not until nearly sixty years later that the idea of redesigning a new, more modern golf course evolved. Many of the holes on the New course play close to, or in the case of the 18th, over the beautiful River Mole and most of the holes are framed by mature woodland or specimen trees. The course was built by Abbotts Ltd. and measures 6,957 yards from the Black tees. The course has matured to the point where it is frequently used for Europro Tour events. Not a very good or interesting course at all. It is basically farmyard golf as it feels like your on a field when playing. I wouldn't say that there were any memorable holes at all and they all felt the same, the only good thing about the course is that its normally in good condition but it really is very boring and uninteresting. I think the only reason why it is placed highly in surrey is because as a club it is nice due to the large clubhouse and the old course being quite a nice track. If you want to play here and have a choice between the old or the new, pick the old. I have played Burhill's New twice now, once in the winter and now in the summer - for very obvious reasons the summer game is the one I'll base everything on. Clubs that have 36 holes are in a great position for their members and visitors alike and the two courses here do offer a very different offering. To put my cards on the table early, I prefer the Old course by a fair bit as it is the 100+ year old Surrey style of course that is very familiar but the New is worth playing, in-fact the greens on the New, are superior to the Old. The style of this course is modern; USGA greens, bold and decent bunkering, fairly open and similar in style to the London Club courses and maybe a little bit of The Oxfordshire too. The first standout hole is the 330 yard 3rd - position is everything from the tee to leave a short manageable shot to a protected green. The 9th is good too - bunkering on the whole hole is perfect; under 400 yards and if you avoid the sand on both shots to the green, then you are doing well. The only real negative I have about any of the holes comes at the 13th; a monster of a par-5 (589 yards at the back) but it is just long, straight and that's about it - this hole is crying out for some shaping; squeeze the fairway from the left-side at about 250 yards and then from the right-side at 150 yards out, then you can create a snake-like hole that would be so much more fun to play, at present it is just two big hits without much trouble and then a short to mid-iron to a big green - add in that this is SI-1, this is going to be a 3 pointer for most! The 15th is a great hole; no bunkers at all but a lake in-play for the big hitters off of the tee and then for all on the approach, makes this a very strong par-4. Any course that ends on a par-3 will always get my full attention as it is not my choice of closing hole, so if it is there it better be good! Worry over, this is a strong hole - between 114-192 yards over water to a green (very tricky) with a severe run-off at the front and the beautiful clubhouse behind. I have enjoyed my rounds on the New but if I only had time to play 18 holes, then the Old is my choice.